The Conservation Commission typically meet the 2nd Monday of the month. Meetings begin at 7:00 PM and are held in the Town Office upstairs meeting room, 6 Pinnacle Hill Road. Over the past two years the New Hampton Conservation Commission has been hard at work to restore to life the Kelley-Drake Conservation Area. A two-mile trail system had been constructed, complete with blazing and signage. The extensive Kelley-Drake farmstead cellar holes have been cleared and a kiosk installed, donated by the New Hampton Historical Society that describes the history of the property. It is well worth a visit to this historical site and natural resource, one of the earliest settled sites in New Hampton. Walk the trails, relax under a grove of trees and enjoy the natural beauty of this fantastic community owned property. To get there: Take Sinclair Hill Rd., turn onto Kelley Pond Road. Follow the trail signs and blazes to explore the forests and fields of this town owned property. The Natural Resource Inventory maps of New Hampton below are a result of several years of work. 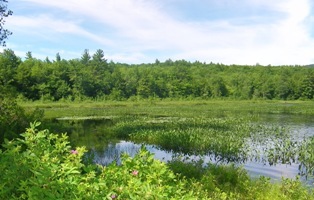 The Plymouth State University contracted with Dr. Rick Van de Poll of Ecosystem Management Consultants to do the work. Additional contributors were LRPC and GRANIT. Each map contains an explanation of the data sources used and the agencies and organizations from which the data was obtained. Wetlands maps were updated using recent aerial photos. A narrative to go with the maps, which explains the methods and findings, should be completed this summer.